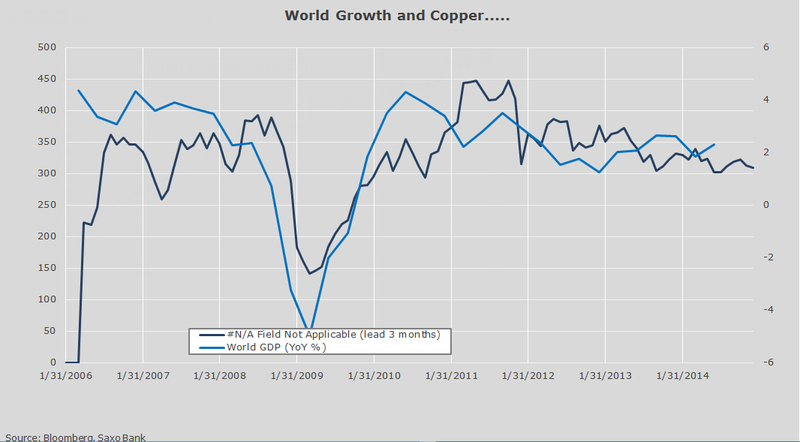 World Growth vs Copper. Iron-Ore At 5 Year Lows. Copper is frequently cited as a leading indicator of economic activity because of its widespread use in many sectors of the economy, from homes and factories, to electronics and power generation and transmission. For that reason, some call it “Dr. Copper“. 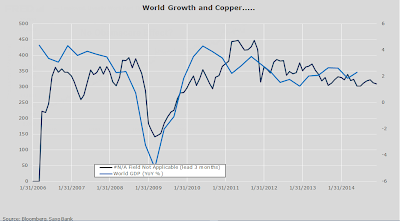 Inquiring minds may be wondering what copper has to say about future economic growth. The following charts will explain. 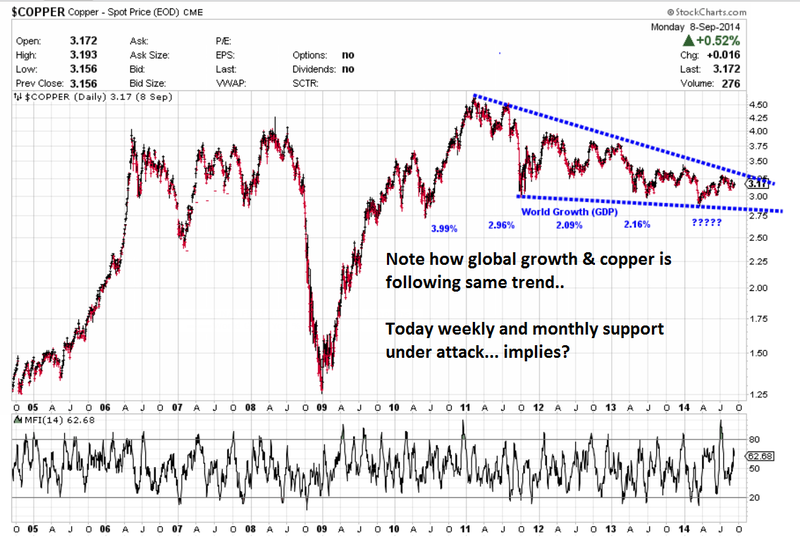 The above charts courtesy of Steen Jakobsen, chief economist at Saxo Bank. China is slowing and its property bubble is under severe pressure. But it’s not just copper that is under pressure. Iron has taken a big hit, and iron producers are under severe stress. Reuters reports Iron Ore Price Plunge Claims First Australian Casualty. Plunging iron ore prices have dealt their first blow in Australia, sending fledgling miner Western Desert Resources Ltd into administration after it failed to reach a deal with bankers over its debt. Western Desert was caught out by a move by the world’s top four iron ore producers to flood the market with low-cost supply, outpacing Chinese demand growth for the steel-making ingredient and slashing iron ore prices by 38 percent this year. UBS estimated that even at present iron ore prices, smaller producers Atlas Iron Ltd, Gindalbie Metals Ltd and Grange Resources are all under water. Iron ore, which is priced in U.S. dollars, has sunk to a five-year low of $83.60. Australian miners have felt the impact even more as the Australian dollar has risen 5 percent against the U.S. dollar in that time. China imported 8.5 percent more iron ore in August than a year earlier, but imports for the year are expected to grow by only 49 million tonnes, well below the volume of extra supply, according to Australia’s official forecaster. Iron is under pressure even with rising demand from China. What happens if future demand disappoints? 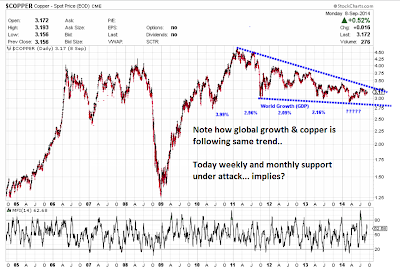 I have been stating for quite some time that China is on the verge of a major slowdown and base metals would be affected, and so would the currencies of major commodity exporters like Australia and Canada. China cannot and will not grow at 7% a year as most expect. The consequences of that have yet to be felt. Finally, those who think the US will decouple from this global mess are just as wrong as those who thought China would decouple from the global economy in 2008.